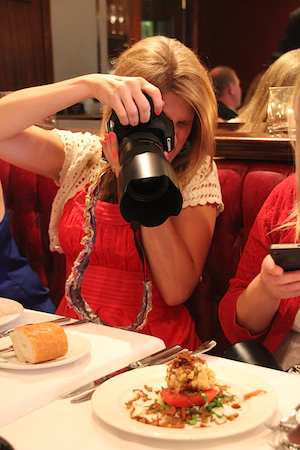 Food blogger Amanda Bottoms picks up a camera before she picks up a fork. Greetings and salutations from the Big Easy, diners! For the next several days, I’ll be reporting from Louisiana as part of the Louisiana Seafood Food Blog Masters. Attendees include Daniel Delaney, Amanda Bottoms, Nathan Lippy, Marla Meredith, Adam Roberts and Craig Johnson, Maggy Keet, Matt Armendariz and Adam Pearson, Brooke Burton, Gaby Dalkin, Amy Sherman, Emma Christensen, Chichi Wang, and Jenny Flake. We’ll be dining out and diving in, literally and figuratively, to the seafood scene in the Bayou State, visiting top restaurants and talking to the people who are the backbone of New Orleans cuisine, from crabbers and oyster farmers to chefs and restaurateurs. Tonight, we kicked things off with dinner at Bistro Maison de Ville, where we feasted on everything from catfish and crawfish to frog legs (!) and oysters, courtesy of chef Greg Picolo, a New Orleans native! Okay, I only picked at the frogs legs, but everyone else feasted on them. You can check out more pictures over at Flickr. And, check back for coverage of the Louisiana Seafood Festival, and much more, from NOLA.